My name's Jessica and I'm the founder of OutLash. You'll find me everywhere; juggling my schedule, seeing clients on a daily basis and helping manage things behind the scenes. I started lashing in 2012 and offer classic, volume and mega eyelash extensions. I love lashes because there's something for everyone and the convenience + confidence they bring! You'll find me at home working on another home improvement, hiking or camping when I'm not at the shop. I like to spend my time off with my loved one! A movie night in is our idea of fun! I enjoy trying new recipes, all while pinning DIY projects that I never seem to get to! Friends and The Office are my favorite shows and I constantly binge watch both. I'm the manager here at OutLash. You can usually find me doing something random around the shop, entertaining OutLash guests or loosing my mind in secret. I've been in the beauty industry for longer then I care to remember. I started out as a receptionist in a hair salon when I was 16 and finally went to makeup school when I was 18 and then went back to school in 2014 to become a Nail Technician. I am obsessed with pop culture, celebrity culture, fashion and beauty. My name is Sarah, and I’m a Medical Aesthetician, Makeup Artist, Drummer, Drawer, maker of corny jokes, and lover of all things beauty + skin care. As someone who has struggled with taming my own problematic skin since adolescence, it’s become my passion to ease the battle for others who may also be struggling with skin issues. It’s my goal to help others feel comfortable in their skin and to glow from the inside out. I have always had a passion for all things beautiful, and I strive to give individual perfection to each one of my clients. I have been offering beauty services for over three years and have been educated by some of the industry's giants. I am Multi-Certified in Classic and Volume Eyelash Extensions, Microblading and Cosmetic Tattooing. I have been part of the Outlash team for just over six months and could not ask for a better place to work. My favourite part of working at Outlash is making women feel beautiful and giving them the confidence to take on the world! Hi! I’m one of the junior technicians at the boutique and I've been with OutLash since March of 2018. I am certified in the Classic, Volume and Strip Lash by Glitzlash and Peacelash lashes. My favourite service to offer is volume lashes. I love doing lashes because I love making my clients feel confident. I'm a Senior Lash Artist who has been mastering the lash craft since 2016. I have many certifications in eyelash extensions including, Classics, Volume, Mega Volume and the newest trend, Striplash Look! I also hold a certification in body and Brazilian waxing, lash lifts, tinting, threading, microblading, microshading and permanent makeup application. I've been lashing for three and a half years, and have been with Outlash since March 2018 providing eyelash extensions, waxing and tinting services. I love making people feel beautiful and confident! I specialize in volume lash extensions and I believe there’s a lash style for everyone! I've been in the beauty service industry for about seven months now, having started at Outlash in early October 2018. I'm certified in Volume & Classic lashes, lash lifts, as well as brow rehab. 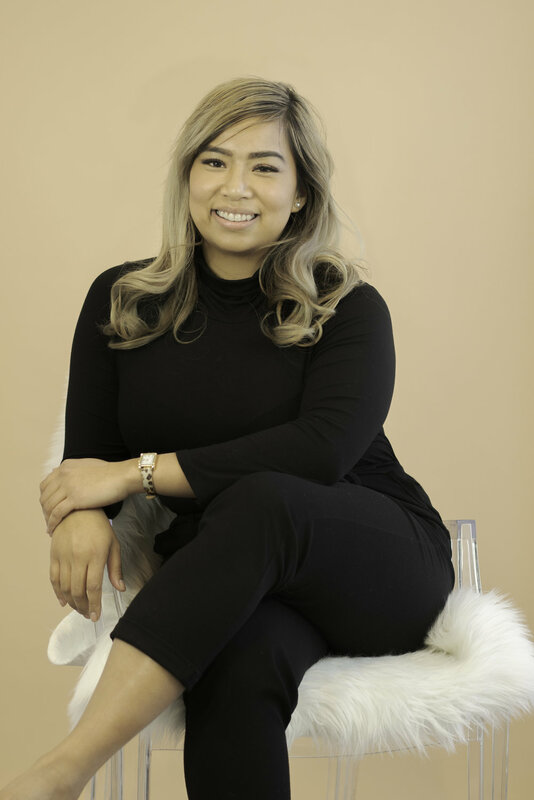 My passion for the beauty industry mainly revolves around constant opportunities to learn new things and the desire to grow to be the best service provider I can be. When I'm not lashing, I love catching up with family and friends, snowboarding when it's possible, and obsessing over dogs walking down the street. I'm one of the receptionist’s at OutLash and I’ve recently joined the team as our newest junior lash artist. You’ll find me answering your calls, booking your appointments and see all your beautiful faces in between seeing clients. In my spare time, I like to dance and am part of ILLFX Education. I'm a massive foodie and I love trying new things! I’m one of the junior lash artist’s at OutLash. When I’m not at the shop, you’ll find me juggling one of my other jobs! My name’s Anna and I’m the red-haired gal answering your phones and booking your appointments!